"Spy Shot du proto de la nouvelle potence d'une toute nouvelle marque de Flat français. Découvrez le matos aux Worlds 2013. 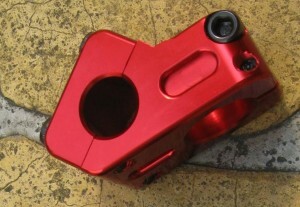 Spy shot for new stem prototype from a new french flatland brand. Discover the products at Worlds 2013." We'll keep our eyes open at the BMX Worlds in Cologne and show you more of their products later.